The Cessna 205 respectively Cessna 206 Super Skywagon & Stationair is a single-engine four- to six-seat light touring and utility aircraft produced by the US-American manufacturer Cessna Aircraft Company, today a brand of Textron Aviation. 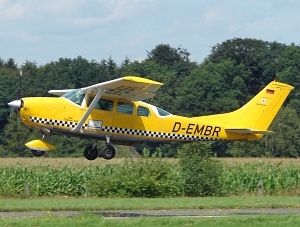 The Cessna 205 is a derivative from the with fixed landing gear. The Cessna 205 was in production from 1962 to 1964 with a total production of 576 aircraft. The Cessna 206 is still (or again) in production as Model T206H Stationair. Total production of basic model 206 including Models U206 & P206 was more than 12400. One of few Paraguayan drug-running a/c kept at Nu Guazu by the FAP, the majority is from Argentina and Brazil.